St. E. Premte Church . Cleveland is located on the west side of Cleveland, OH approximately 15 minutes from downtown. The early Albanians immigrants in Cleveland settled on the near west side, north and south of Detroit Avenue. There were a few in the Linndale section around West 117th Street where they worked in the roundhose. Some were also to be found around St Clair and East 30th Street. The first Albanians to immigrate in America were mostly Orthodox Torks, settling especially on the East Coast. As so many other immigrants, they were mostly uneducated and without any special training. The majority of Cleveland Albanians were originally from the area around Koritza, arriving here just before World War I. They were joined by other countrymen right after World War II, but very few were allowed to leave Albania after that due to the harsh Communist regime in control there. The majority of the Cleveland Albanians were of the Orthodox Faith. Having lived among the Vlachs (Romanians) and Greeks in their native land, at first they worshipped either at St. Mary’s Romanian Church otr the Annunciation Greek Orthodox Church. 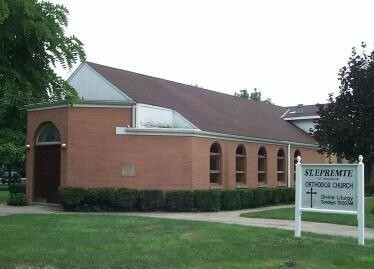 Cleveland’s Albanians of the Orthodox Faith founded the Society of St. E Premte in 1938. They chose St E Premte as their patron saint. She was born in Serbia and died a martyr’s death in Tarnova. Her relics were eventually interred in the Three Hierarchs Church of Iasi, Romania, where ceremonies are held annually on her feast day of July 26. Land was purchased on Jasper Avenue, west of 105th Street in 1944. In 1955 a Church Hall was under construction, including a temporary Iconostas. At that time there were about fifty families in the parish. They affiliated with the Albanian diocese of Archbishop Fan S (Noli) in Boston, who assigned Fr Stephen Lasko to the parish in 1955. Ground was broken for a Church Proper in 1964, and regular services began in 1965. Bells were installed in 1975. The Church was also consecrated in 1975. After the death of Archbishop Fan S (Noli), Fr Lasko left Cleveland and was consecrated a bishop on April 30, 1975. After Fr Lasko left and the older generation were slowly passing away without being replenished by new immigrants from Albania because of the restrictions of the Communist regime, the parish was administered by a number of temporary, non-Albanian pastors, who held services in English with some Albanian hymns sung by the few remaining older members. When Bishop Lasko died, the Orthodox Church in America, with which the Albanians are affiliated, sent part-time priests to serve the parish. This arrangement exists to this day. Notwithstanding, a few dedicated and hard-working parishioners there keep the parish alive and press on to promote their Orthodox Faith and Albanian Heritage.